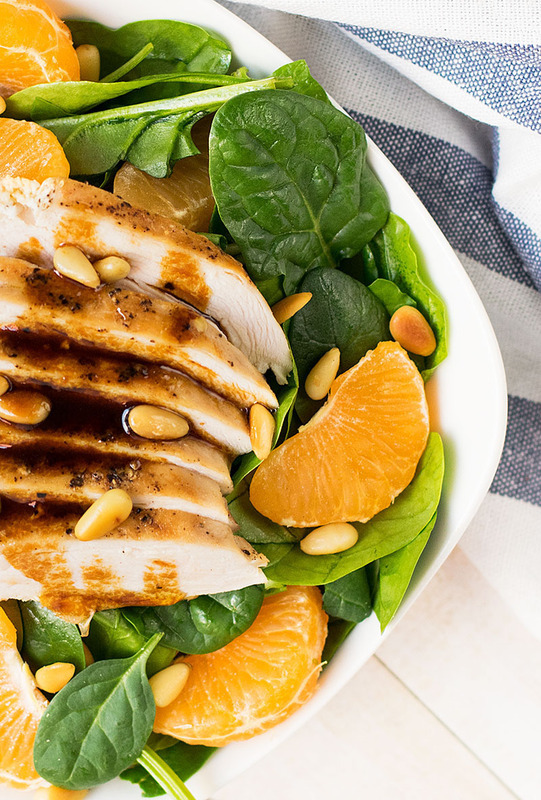 Perfect as a lunch salad, it will keep you full until dinner! Sometimes, I also use cheese, like in this arugula, goat cheese and green apple salad! Some people may find the combination of chicken and fresh tangerine a bit weird. 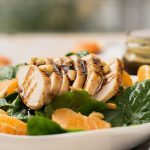 But, chicken actually goes really well with any kind of citrus, and there are numerous chicken recipes which use citrus juice as a basic ingredient. So go for it, don’t be skeptical! 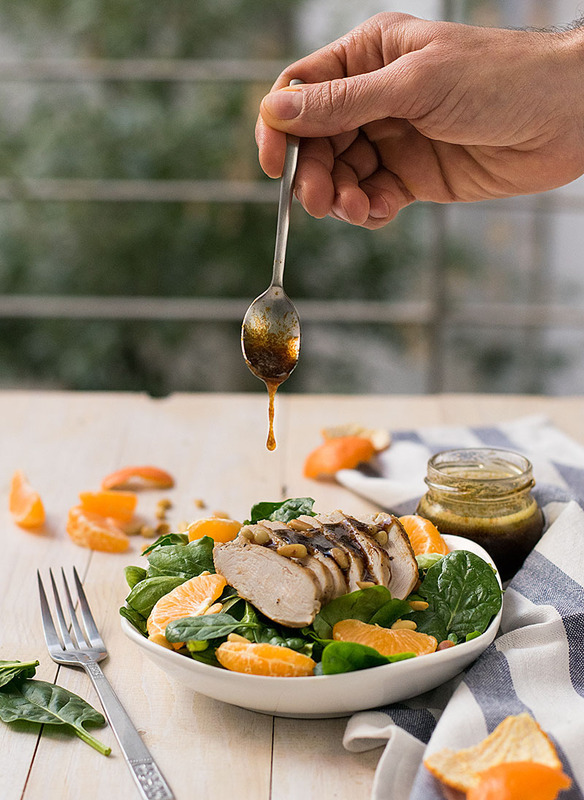 The dressing is made with equal parts of pomegranate molasses and olive oil, and it’s full of antioxidants! Pomegranate molasses is basically pomegranate juice which has been boiled down to a thick syrup. You can probably find it at the aisle of your super market with the middle eastern goodies, or just make it yourself and use it to marinate meats and add it to sauces and many more salad dressings! This is a typical recipe. Oh, this salad has a couple of tablespoons of nice, golden sultanas. What? You can’t see them in any of the photos? Well… Are you going to make me say it? This green salad, as I’ve said, is perfect as a lunch for work, since it can easily be stored and transferred in a container, without any problems. The chicken can be boiled, baked, pan roasted or even be a rotisserie one, though I have a special place in my heart for the pan roasted due to the extra flavor of its brown, caramelized surface! (You can see how I pan roast chicken breats in this chicken sandwich with balsamic and olive oil dressing) Keep in mind to store the dressing in separate little jar and drizzle it over the salad just before eating it, to prevent the spinach from wilting. If you want to maximize the absorption of iron you should combine spinach with foods rich in vitamin C (citrus, peppers, strawberries, etc) or apples, pears and ciders. Instead of pine nuts, use sunflower seeds or other nuts of your preference! For lots more healthy salads and recipes, check my extra healthy category! 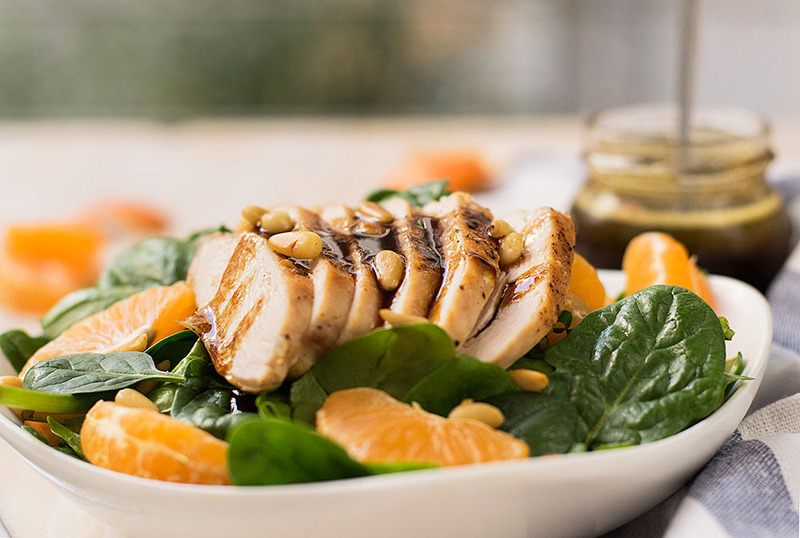 This healthy and gluten free recipe is perfect as a lunch salad. 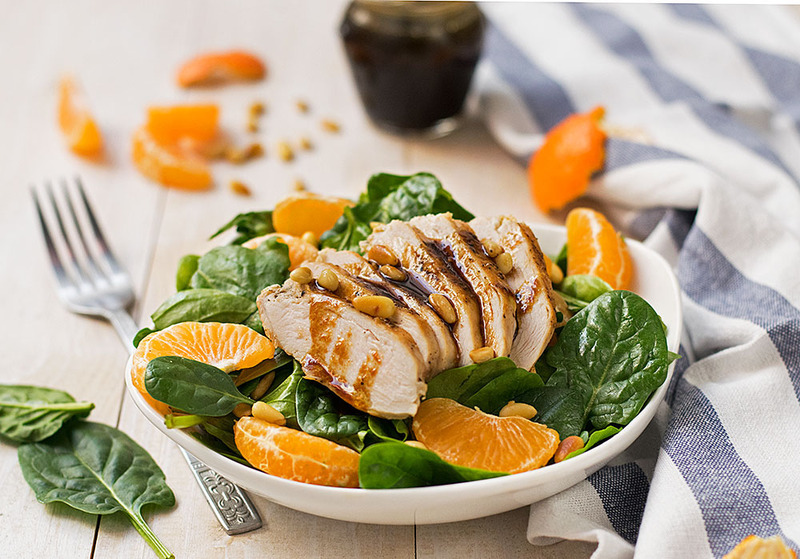 Protein and antioxidant rich, it will keep you full and satisfied until dinner! Place the dressing ingredients in a jar or a shaker and shake well to combine. Mix all of the salad ingredients in a bowl.